Refacing involves removal of old doors, hinges and moldings and adding a .25 inch veneer of various wood types to match the finish of your new chosen doors. By adding or subtracting cabinetry to your kitchens current lay-out you can create your dream space that looks like new, but costs half the price. Typical reface jobs come in at half the cost and in half the time of new cabinetry, without all the mess. Construction times are typically two weeks with one week off site in our shop to stain and finish and only one week in the house to install. Use our provided kitchen bins to stay organized during our install and in one week unpack and enjoy your beautiful new kitchen. Refacing involves removal of old doors, hinges and moldings and adding a .25 inch veneer of various wood types to match the finish of your new chosen doors. Elements like pull-out shelves and european hidden hinges, new drawer boxes, wine refrigerators, under-cabinet lighting, pull-out garbage cans and various selections of glides, are a great way to stay organized while maximizing your kitchens space. We make custom matching hoods and decorative elements as well. We customize your kitchen to your needs. With hundreds of stain and finish possibilities, you can customize your kitchen to your hearts content. Please browse our finished jobs in our gallery for some design inspiration. Steve Mertz began woodworking over 40 years ago. He started by carving walking staffs and sculptural stack laminated furniture. From there, he eventually began business as a finish carpenter. He would do small cabinet jobs on the side that became big jobs that eventually evolved Mertz Custom Interiors in to an all new cabinetry business. 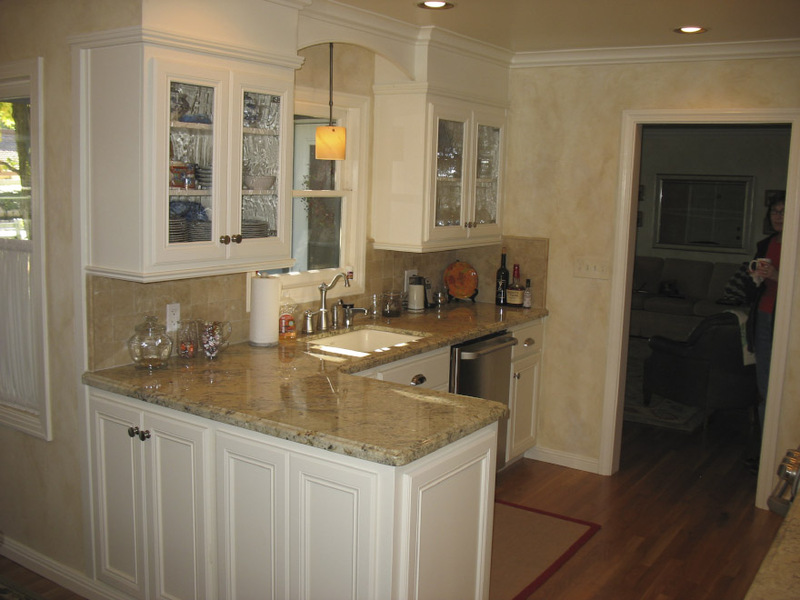 After one or two refacing jobs he began to realize that such a specialty market had major opportunities-not only to grow his business but to save his customers thousands of dollars while still delivering the top quality of new cabinetry. Mertz Custom Interiors cabinet refacing was born. Steve found he loved it and decided to make refacing his primary pursuit. “I love seeing a kitchen evolve from old and dated to something new and beautiful and I like saving people money. If you love what you do, then it’s never work. Seeing peoples faces at the end of a job- So happy and shocked- looking at a final product they never imagined possible is what makes my job worth while. We work with your schedule, give us a call. Need a bid after you get home from work?